Ettore Sottsass' Memphis designs join eccentric contemporary furnishings that decorate a townhouse in New York's Soho for this installation. Open for the month of May, the Raquel's Dream House pop-up is the brainchild of art collector Raquel Cayre. The residence at 79 Greene Street has been furnished in the style of Cayre's Instagram account @ettoresottsass, which pays homage to Sottsass – the late Italian architect and renowned protagonist of the Memphis Group. As with the social media account, the four-storey house features items created from the 1980s design movement. These are placed alongside contemporary pieces that reference the style, which is recognisable for bright colours, asymmetric shapes, and use of plastic. "Through the Dream House, I brought my digital feed to life with works by Ettore Sottsass, Daniel Buren, Memphis Milano, Gaetano Pesce, Max Lamb, Bower Studios and many more infilling the Soho townhouse," Cayre told Dezeen. 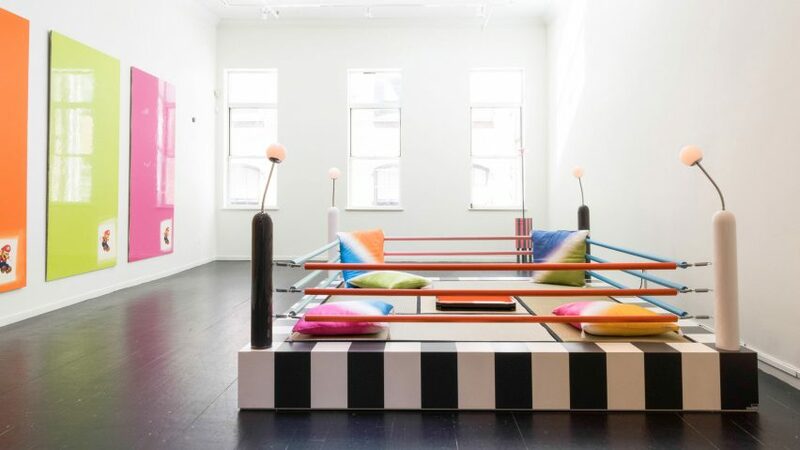 Among the Sottsass creations that visitors to the house will find is the Carlton room divider. Designed in 1981, it comprises a series of colourful geometric shapes stacked on top of one another to form a partition, a bookcase and chest of drawers. Sottsass' multi-functional piece is located on the ground floor, where designer Al Freeman's squishy green lighter, yellow pencil and pink medicine bottle artworks are mounted on the wall. Launched last year, Freeman's pieces join a number of contemporary designs on this level, like a white sofa comprised of different sections so that it curves, a large papier-mache sculpture featuring a face, and a set of stripy black and white columns. Cayre has brought in more designs by Sottsass on the first floor, including a mirror with a curvy pink plastic frame and the Enorme Telephone – a black phone with blocks of red and yellow. The architect's Bay Lamp is also set atop the Peninsula Table by US artist Peter Shire, who completed the piece in 1982, building the table top on legs of different colours and shapes. Two throne-like red polyurethane resin and plastic chairs by Gaetano Pesce, cartoonish paper pulp chairs by Thomas Barger, and fluffy seats by Fernando and Humberto Campana are among other standout designs. On the remaining two levels is a red sofa that resembles a pair of lips designed by Studio65 and produced by Gufram, mirrors that look like archways that were recently launched by Bower Studios, and three sculptural chairs made of polystyrene and metal by Max Lamb. Raquel's Dream House came about after Cayre visited the Greene Street residence. She decided that its white-painted walls and weathered black-painted wooden flooring were a suitable and unusual blank canvas for the bold pieces. She then called upon the contributors, designers and artists to source the range of works. "I saw the space by chance, conceived the idea last minute, then worked to bring the idea to life with a range of leading New York design forces including: Friedman Benda, Urban Architecture Inc, Bortolami Gallery, Ralph Pucci, R & Company, Studio Proba, Salon 94 Design, 56 Henry, and Coming Soon New York," said Cayre. The curator believes the project offers an alternative approach to exhibiting design and artwork outside of galleries. "It's a month-long initiative that re-examines traditional methods of presenting, viewing, and experiencing design, as well as its corresponding modes of display," she continued. Raquel's Dream House forms part of a major resurgence of interest in the Memphis movement, which began a few years ago and continues today. Designer Camille Walala has recreated the style's bold patterns as large murals, including a recently completed graphic covering a building in Brooklyn. Design studios Masquespacio and MPGMB are among other to have also recently used the aesthetic in projects over the past couple of years. Sottsass kicked off the Memphis movement alongside designers Alessandro Mendini, Michael Graves, Nathalie Du Pasquier and more at the Salone del Mobile in Milan in 1982. Featuring geometric shapes and bright colours, the pieces were first developed in reaction to the functional aesthetics of modernism. Among the host of notable collectors of the postmodern style was the late musician David Bowie, whose collection of over 100 pieces went on auction last year at Sotheby's. Photography is by Nicole Cohen. Contributors: Friedman Benda, Urban Architecture Inc, Bortolami Gallery, Ralph Pucci, R & Company, Studio Proba, Bower Studios, Salon 94 Design, 56 Henry and Coming Soon New York.